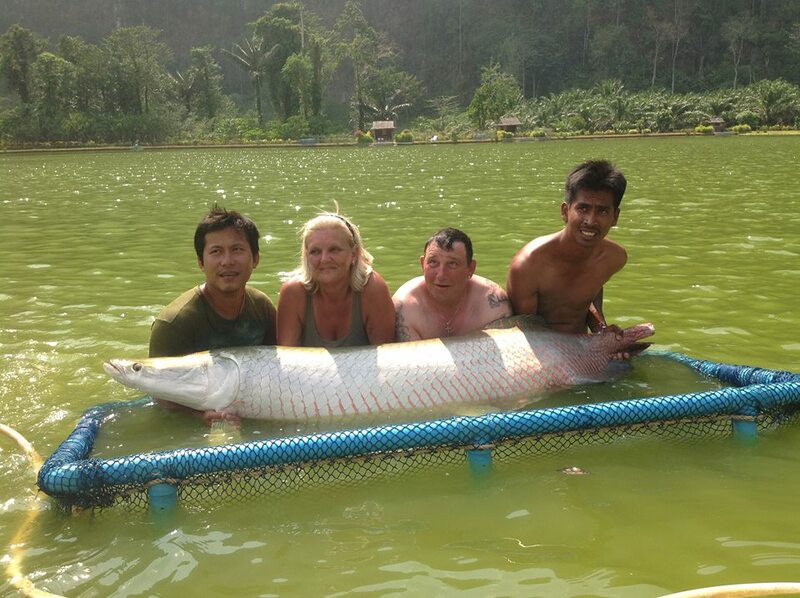 Thank you for joining us to see whats being caught at one of Thailand's premier fisheries in February and March . 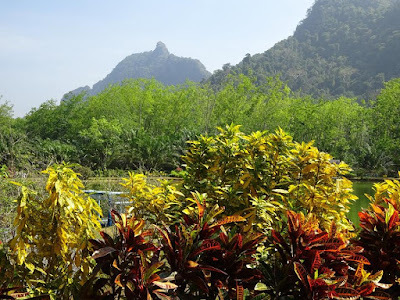 As expected ,both months were extremely hot which put all our flowers in bloom, but also made watering the gardens and lawns a full time job . Exotic Fishing Thailand's popularity is growing in many markets . 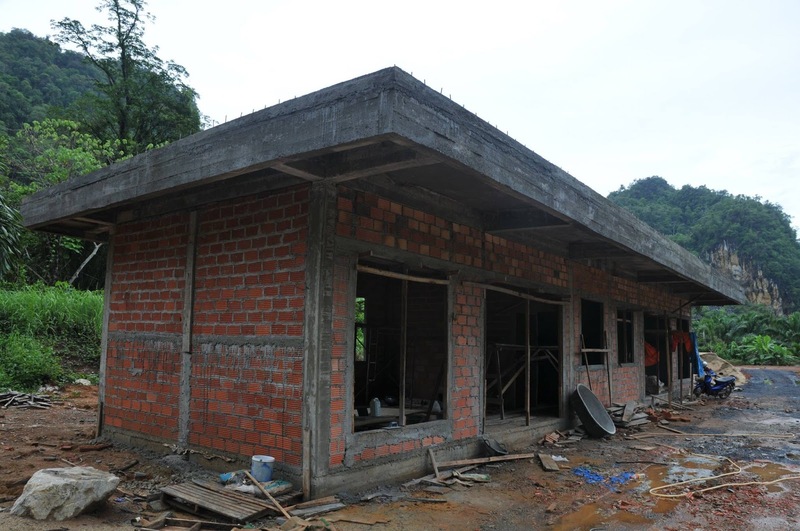 We were recently visited by 2 separate fishing channels from China including some of China's most famous anglers. 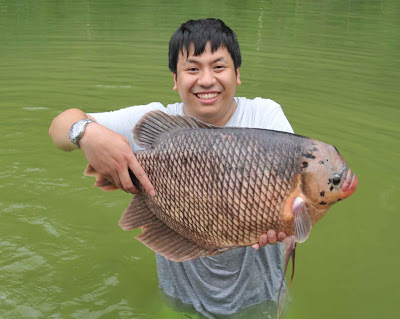 Lee Ta Mao is probably the most viewed angler in the world as the TV fishing channel he is featured on regularly has over 50 million viewers . We also had the BBC visit us for a new show in 2016/2017 called Fishing Impossible . The fishing definitely wasn't impossible though as the host anglers soon caught their target Chao Phraya catfish and were on their way .. 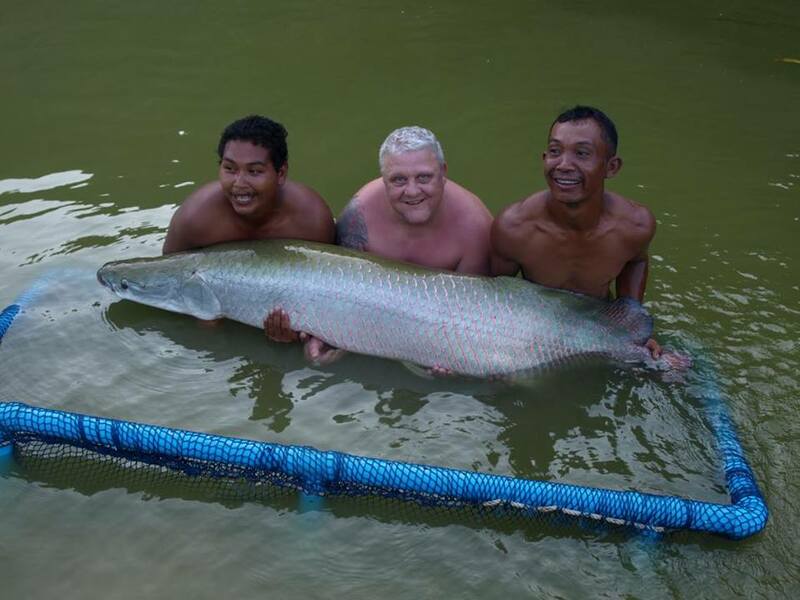 It is always a pleasure to see angling legend John Wilson who returned to Exotic fishing thailand and caught his biggest fish on the fly with this 230lb + Arapaima. 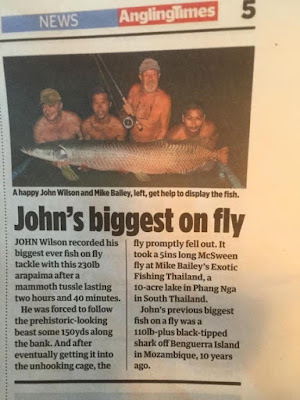 This was also John's longest battle with any fish on a fly rod . The battle on 12 weight gear lasted over 2 hours and 40 minutes .. .
Jan Ibsen "The Captain" returned to EFT and was kept busy wrestling Amazon Redtails .. 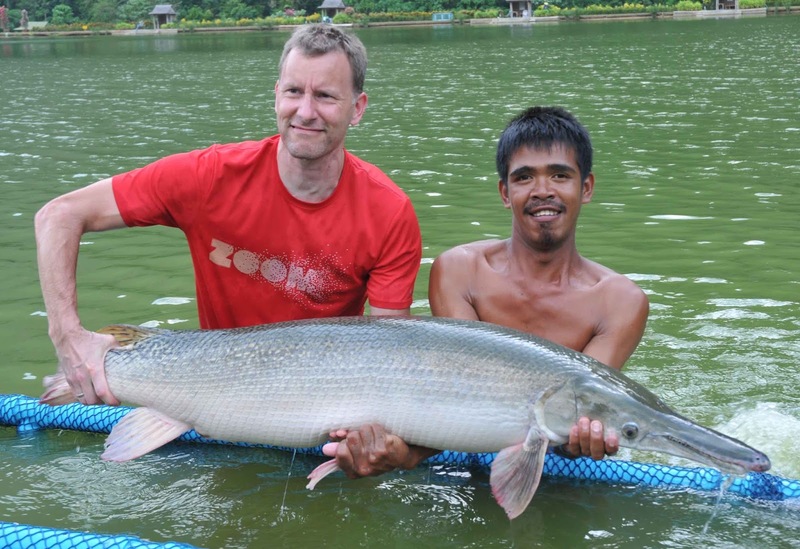 So busy in fact that for the first time he didn't catch an Arapaima. To be fair he was also busy supporting his friends who joined him for their first visit to EFT. Jan did manage a few other species including this Albno Pacu . 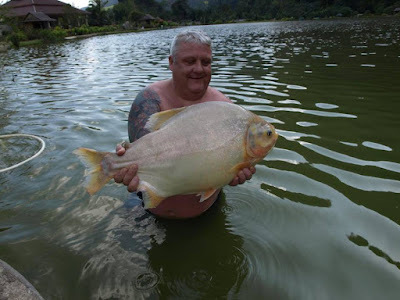 This Pacu also fell for the same trick as its Albino cousin. In my opinion the fish of the trip for Kim Thrane was this very rare Rita Sacerdotum/Salween Rita Catfish. 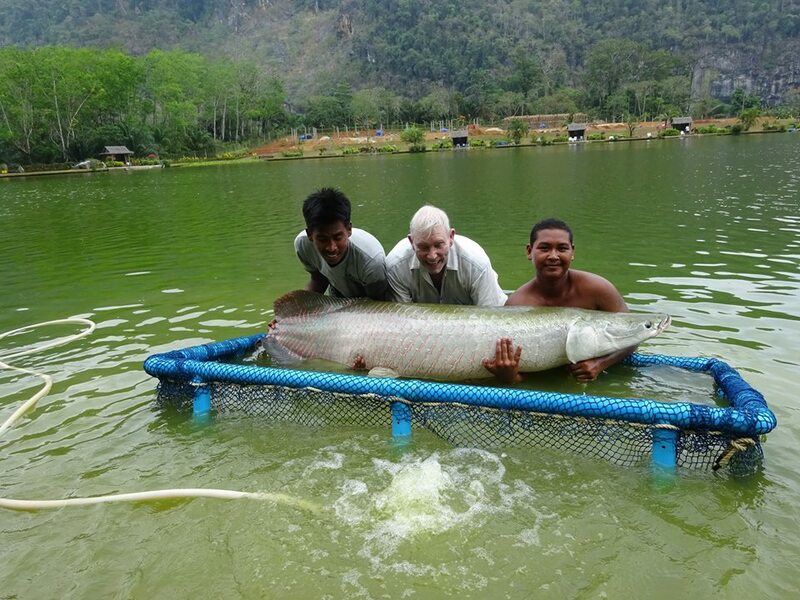 This healthy specimen is one of the biggest we have had out so far at over 40 lbs. If one Salween Rita wasn't a surprise then you can imagine my face when I heard Kim had 2 in the same day . 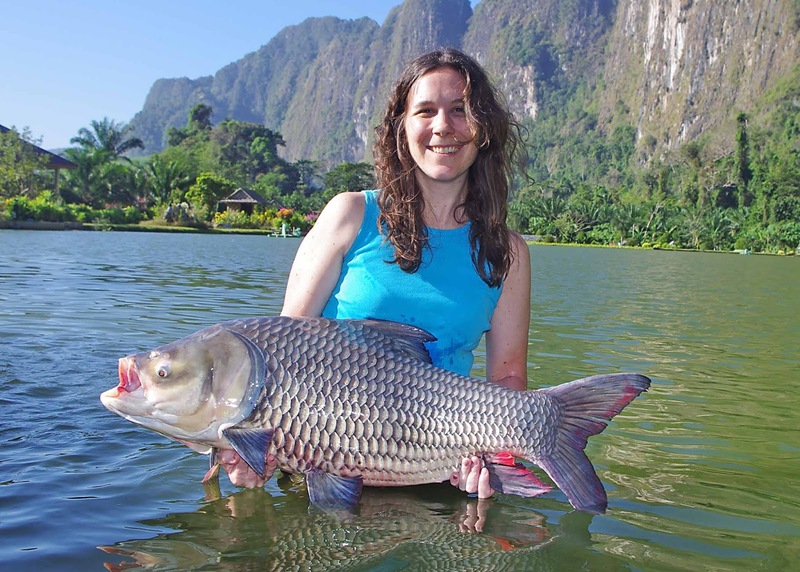 Kim was also following in Jan's footsteps catching Pacu and Amazon Redtails . 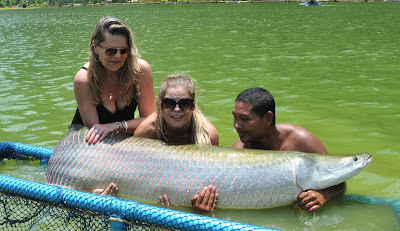 Kim landed the first Arapaima for the group with this beauty . 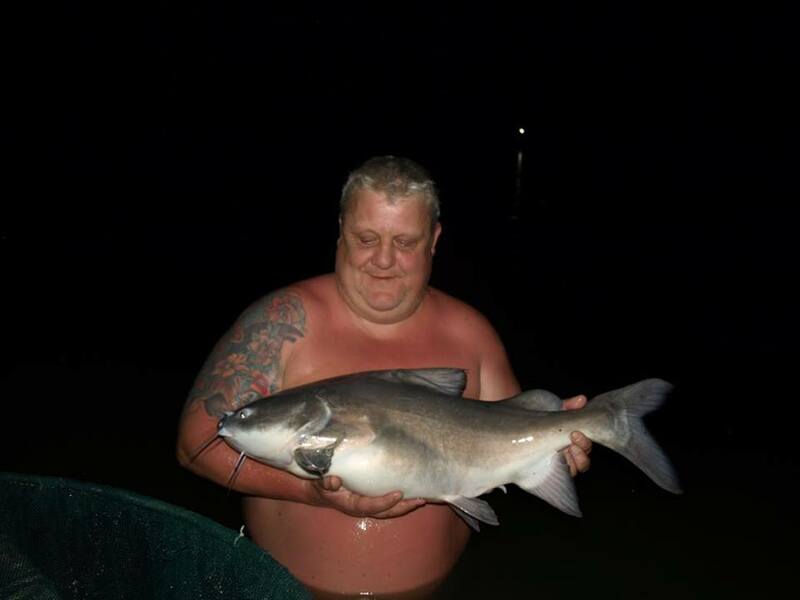 He wasnt messing around and soon followed up with his second. 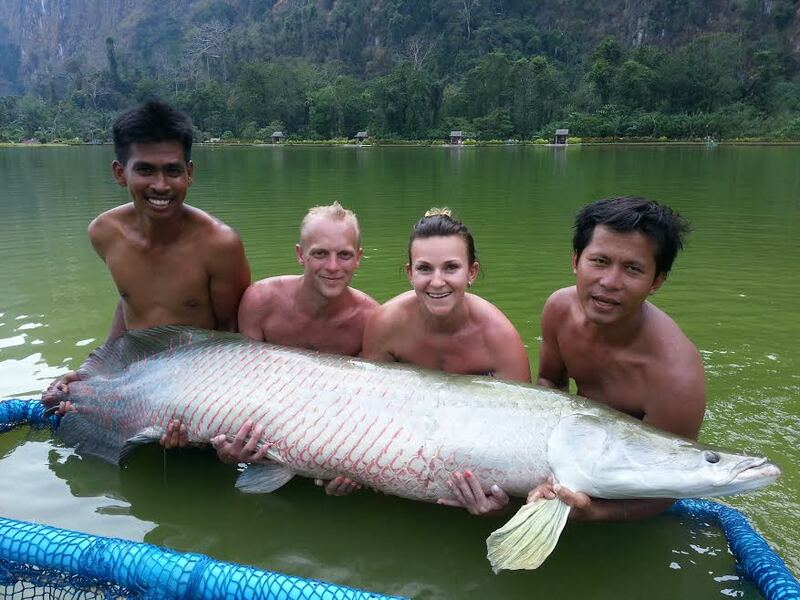 Not to be outdone, the 3rd angler in group landed the biggest Arapaima of the short trip. 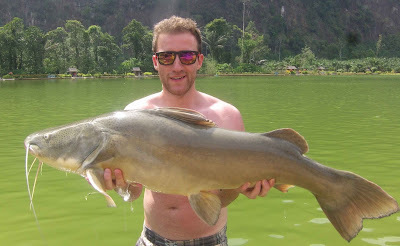 Richard Evans was also here here for first time and wasted no time landing one of his target fish with this Mekong Catfish . He also crossed off a very colourful Arapaima from his wish list. Richard and his guide Lek were having a ball. 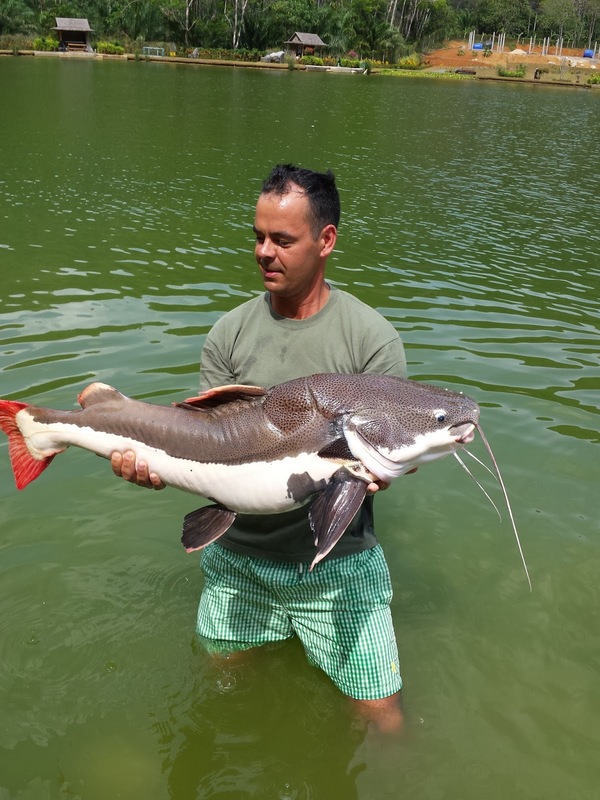 It's no wonder, as they were catching Redtail Catfish 2 at a time. 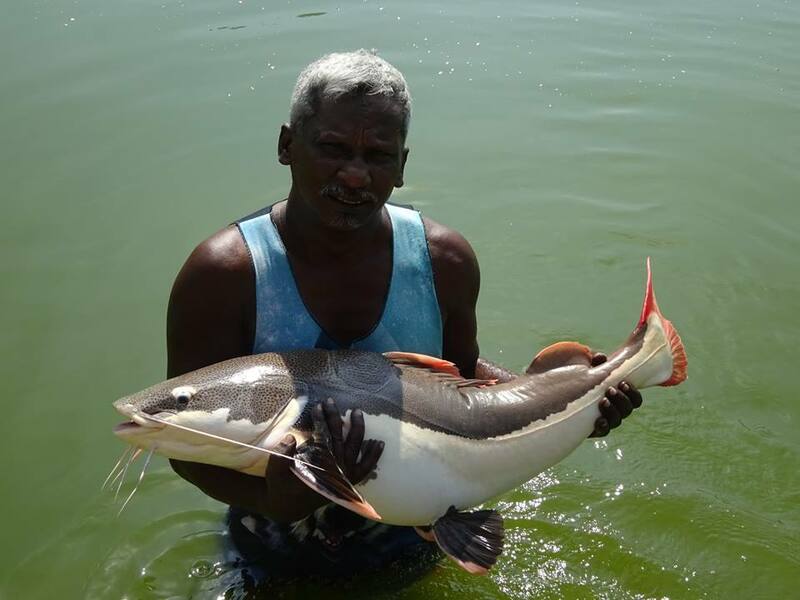 The Catfish craziness continued with Richard's first Wallagoo being a rare Wallagoo leeri. 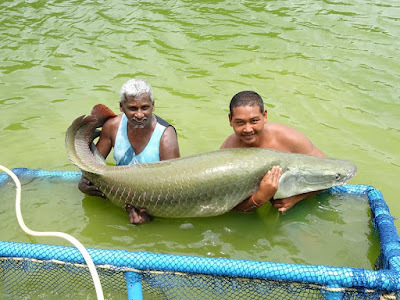 He followed that up with its close cousin and also very rare Wallagoo Attu. 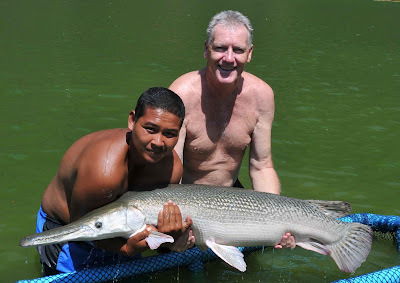 Catching both species of Wallagoo in one day is really quite an accomplishment and to my knowledge unheard of at at any other fishery ..
Paul and Jake brought their good fishing companions Gary and Jody along who really went to work on our Arapama population.. 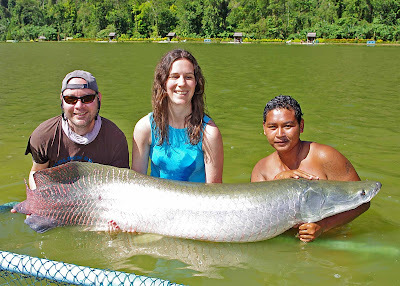 The busy couple also caught lots of other species including an old favorite . I think the Alligator was also a new one . One of several Siamese during Gary and Jody's visit .. We hope to welcome them back here next year . Next up was a nice Siamese carp. 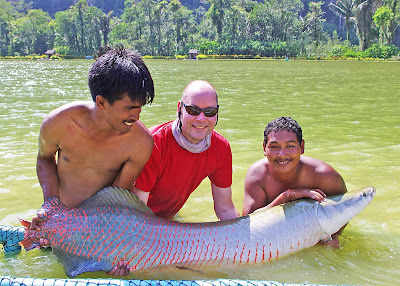 You can see by the photo that our guide's camera training hasn't exactly paid off yet ..
An Arapaima was at the top of Kevin's list but not for long .. 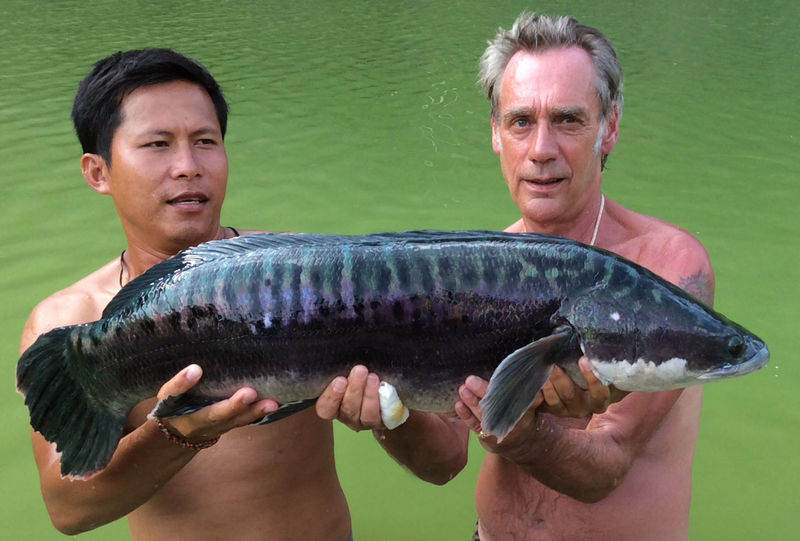 The fish of the trip was this fish of a lifetime , huge Giant Snakehead.. 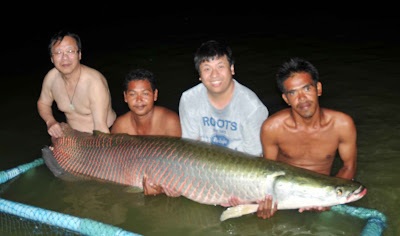 Here is another photo of this amazing specimen . 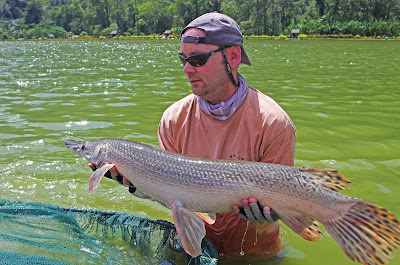 Amazing colours and look at the girth . 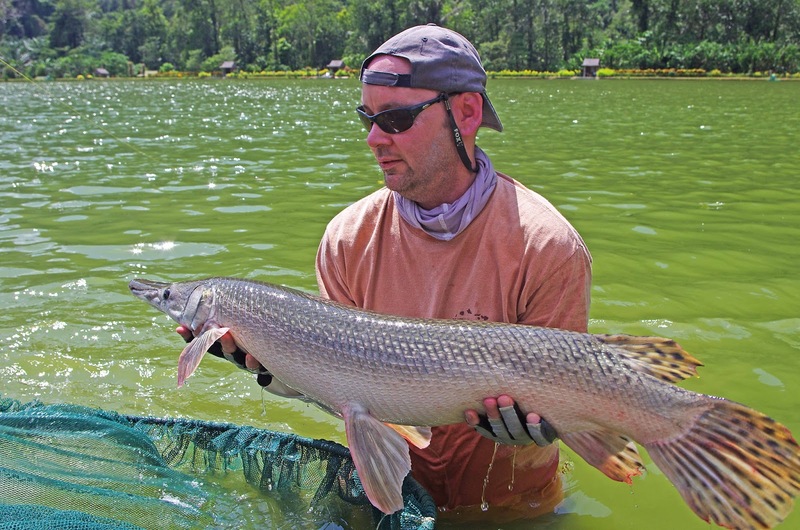 His father landed the next fish which was his first Alligator Gar . 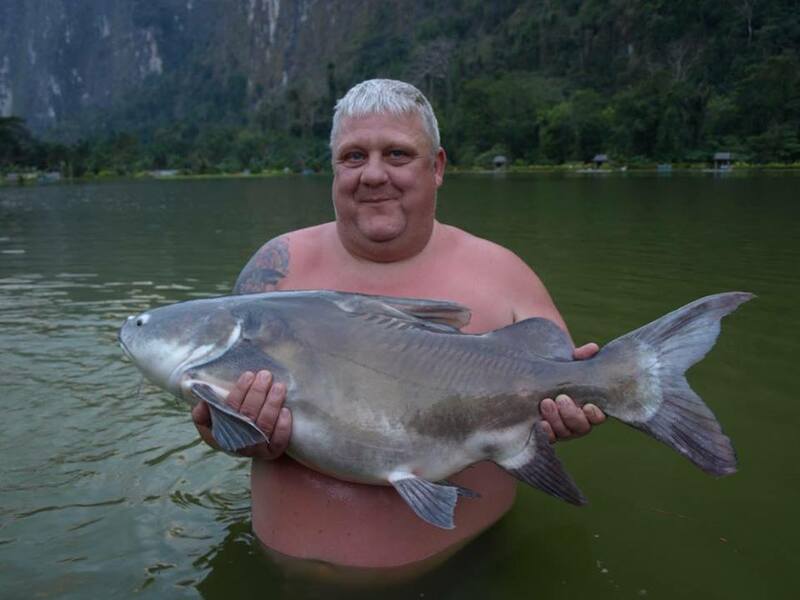 The highlight of the day was just before dark when the predator rod baited with a large piece of chicken tore off . 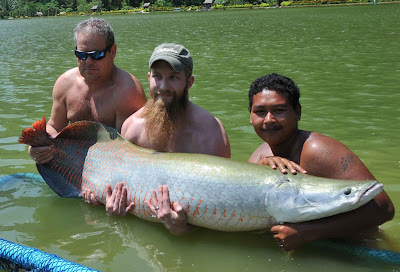 The end result after a lengthy battle was this 200lb + Arapaima .. 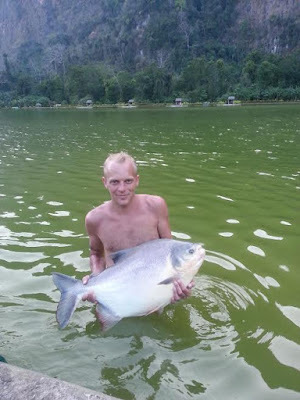 Here is another nice Ari for for these young anglers. This gar was a lot bigger and need 2 of our guides to help with a safe photo . 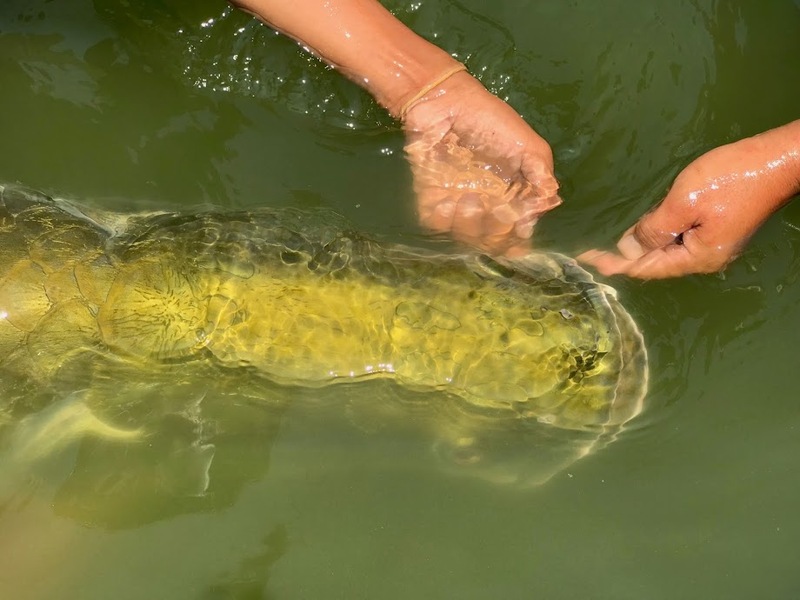 Our Siamese Carp are really growing nicely .. We have electronic chips in most of our fish so we can get accurate growth rates . 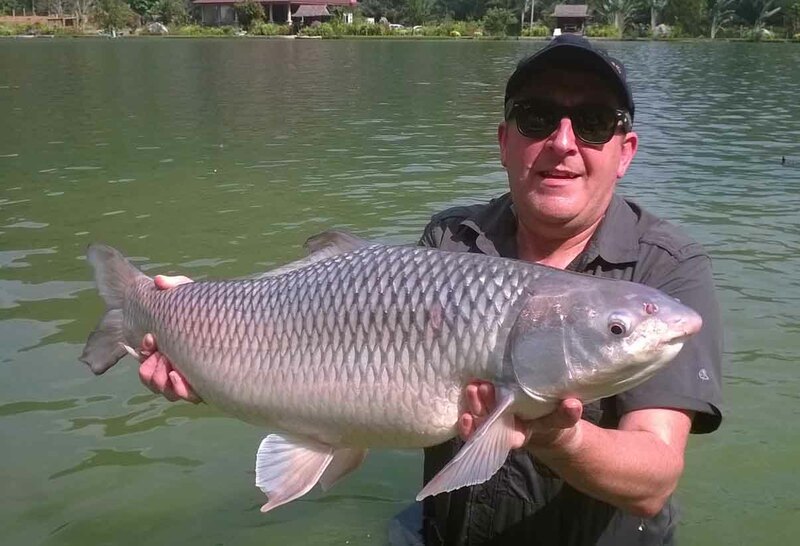 A lot of our Siamese have almost doubled in size with some smaller fish growing from 12kg to over 20 kg in the first 2.5 years..
Another angler also with nicely marked Goonch. 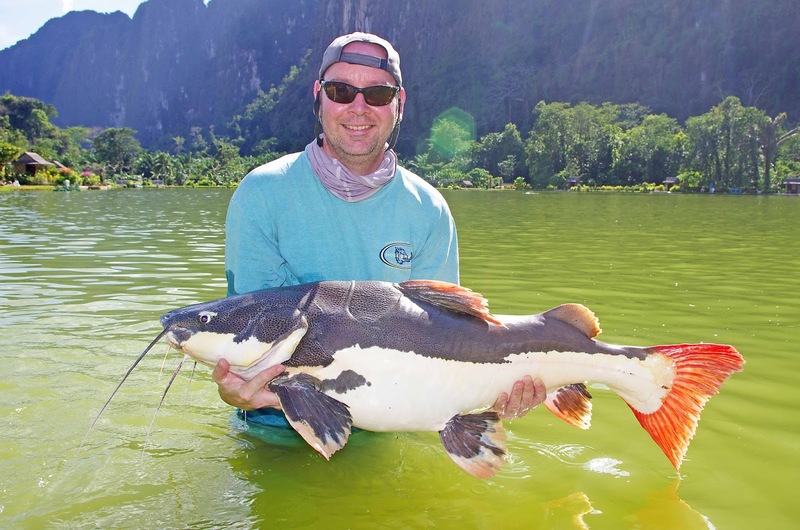 Another type of Featherback is the spotted or Clown Featherback which grows a little smaller than the Giant . 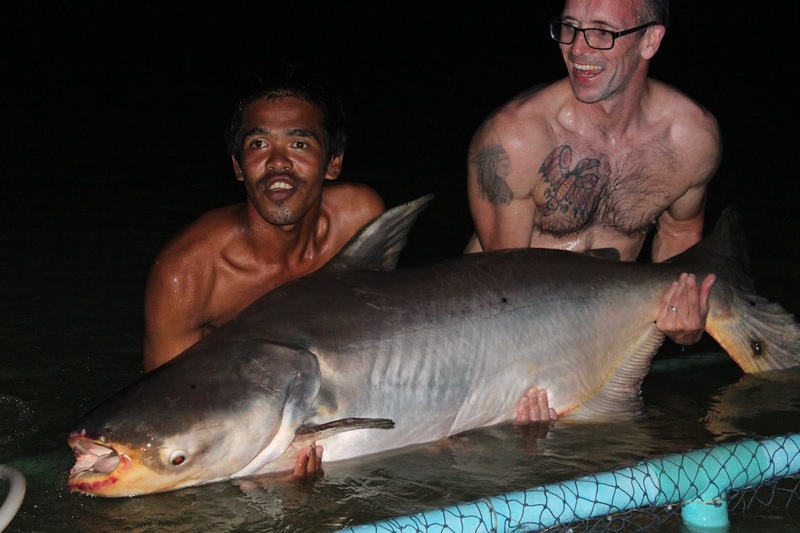 The current world record is around 6.2 kg with bigger fish stocked at EFT . 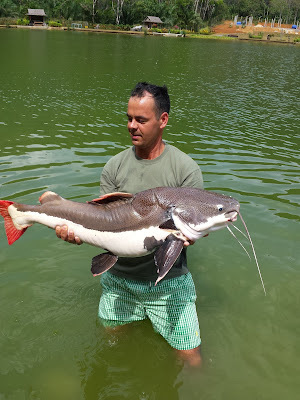 This Wallagoo Attu was a good size also .You can see how it can easily trap its prey with those pads of small needle like backwards facing teeth . 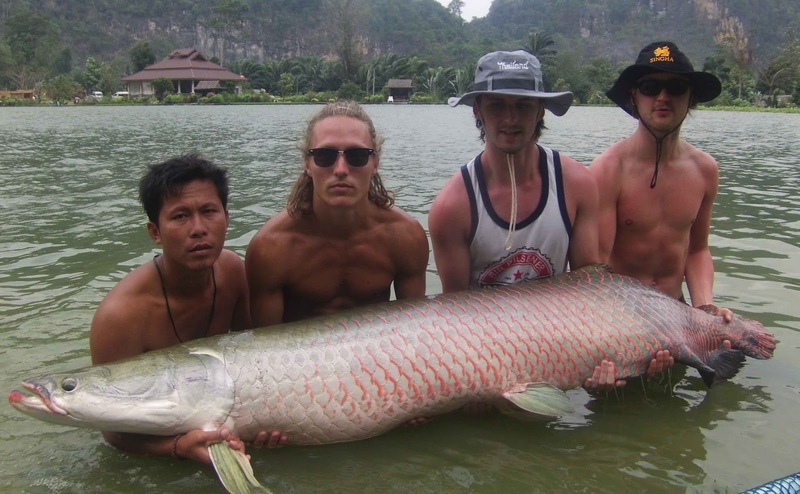 This member of the Hungarian Olympic swimming team took an afternoon off training in Phuket to come and catch the fish of his dreams. If one monster wasn't enough, he caught an even bigger fish later the same day. 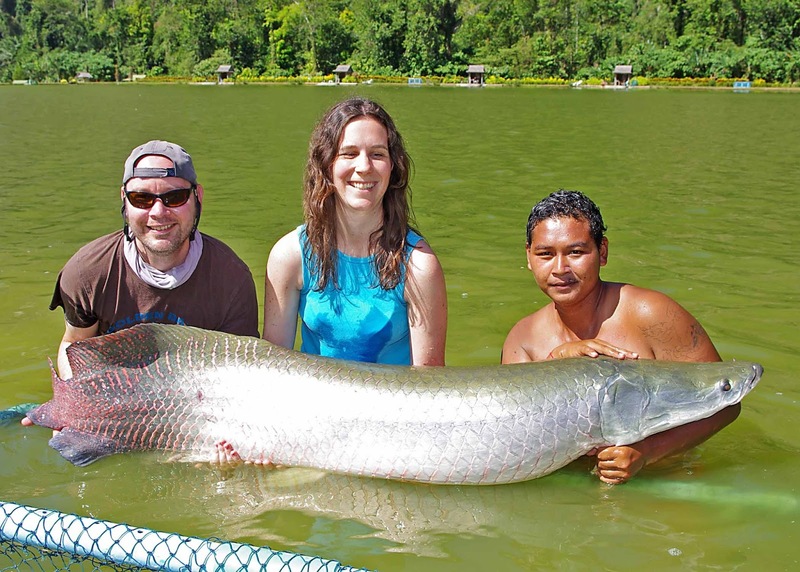 Lots of Amazon Redtails for this smiling couple. 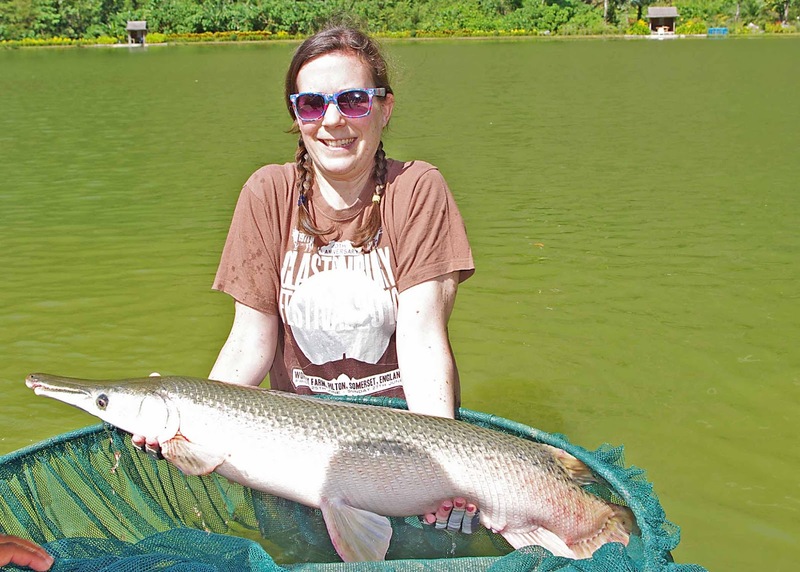 It wasn't just about the men catching either..
Thats quite the chunk of an Asian redtail she had there .. Super fish for any angler. 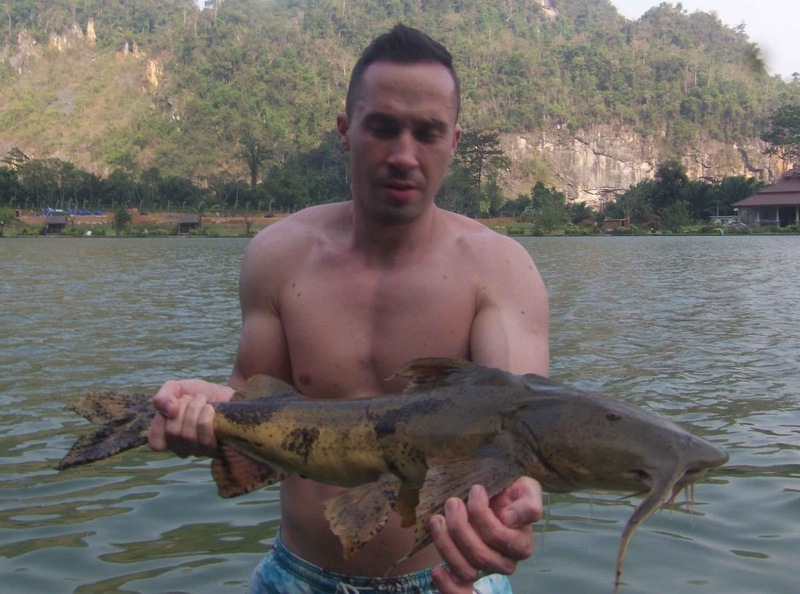 We welcome many Hungarian customers here at Exotic Fishing Thailand. 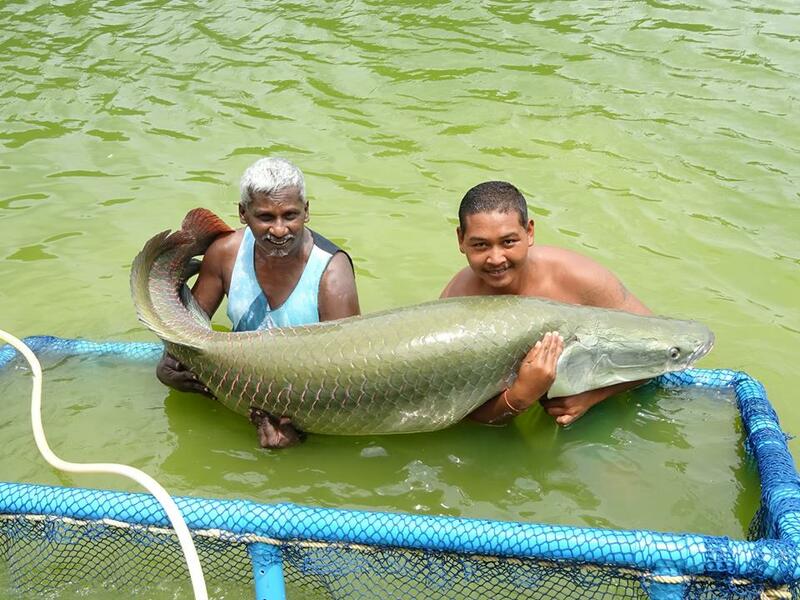 These anglers were both very happy with their Arapaima catch of the day . 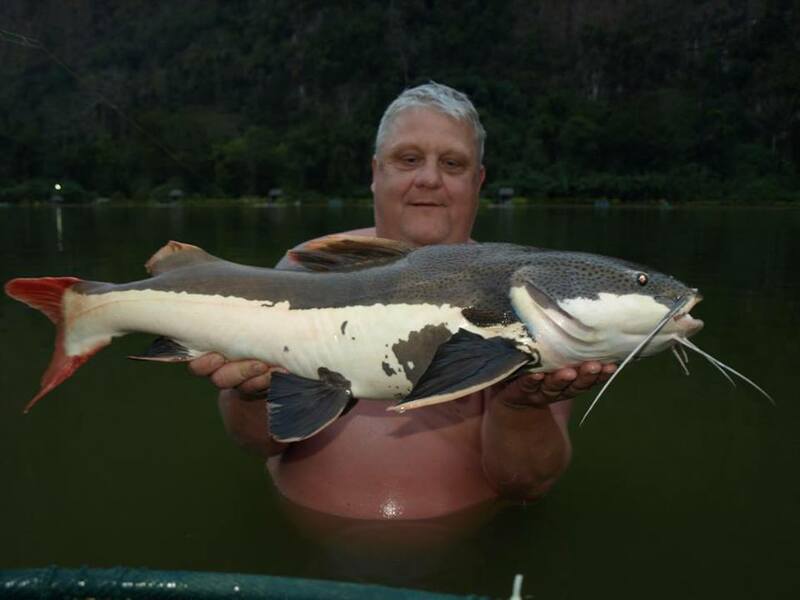 This was Gary Beddows first visit and we are confident he will be back after catching a nice variety of EFT monsters. Then an extra large Ripsaw catfish . The next Catfish was a 40kg+ Chao Phraya Cat caught on chicken . He got more than his fair share of Redtail catfish as you can see here from this beautiful Asian Redtail. Next up was a Chao Phraya Catfish . Jamie was quite surprised by how fast this fish tore off on its initial run and then turned and ran straight back at him. 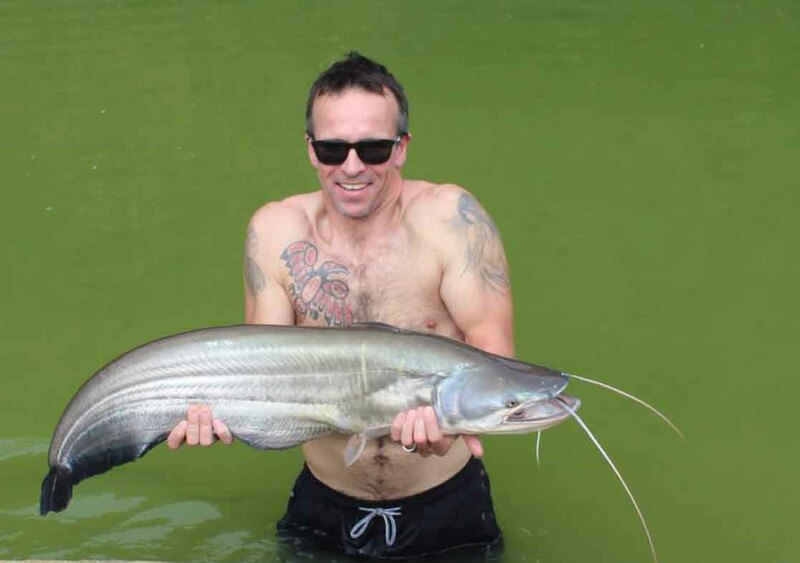 This is typical for these voracious predators ,so be ready when they eat your chicken or fish bait ..
Jamie loves different species and was thrilled to catch a not so commonly caught Salween Rita Catfish . 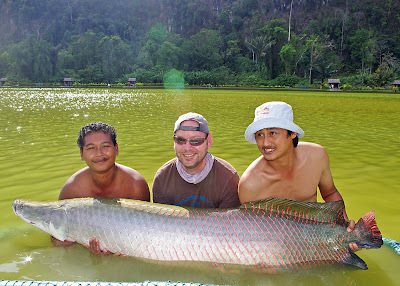 2 great fish and for just the cost of a day ticket ..
Matt's Monster Mekong tested both man and equipment as he hooked it at one end of the lake and then fought back from having only the knot saving him from being spooled to landing this incredible fish at the opposite end of the lake ..
Phuket resident Darren with nice Arapaima. 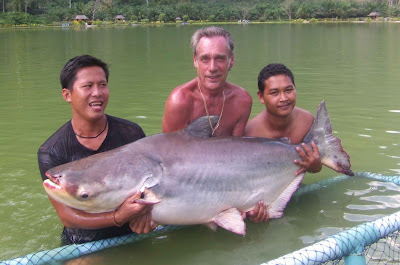 It wasnt just the men catching Arapaimas . 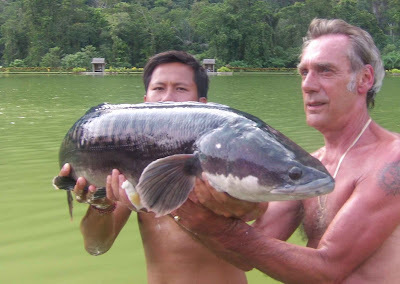 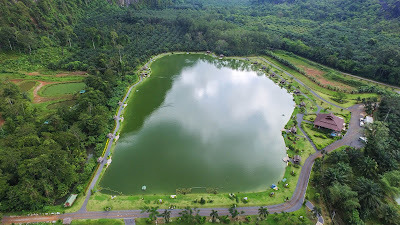 I find that on the average , women generally land more hooked Arapaima than men as they relax and dont try to horse the fish to get it in ..
At one point they even managed an incredible Chao Phraya Catfish , Arapaima double header. 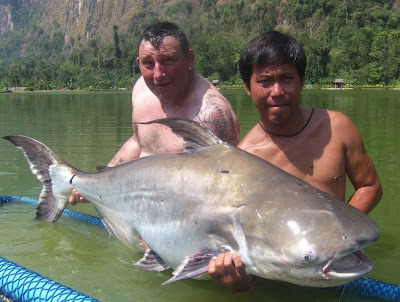 Great work both of you .. 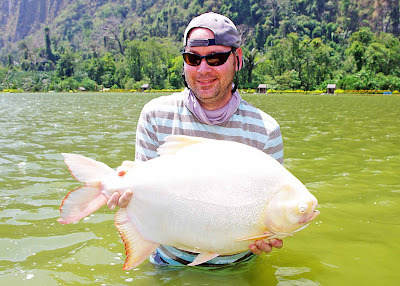 I'm sure we will see you again next year ..
One of 2 Albino Pacu to fill up his catch report . 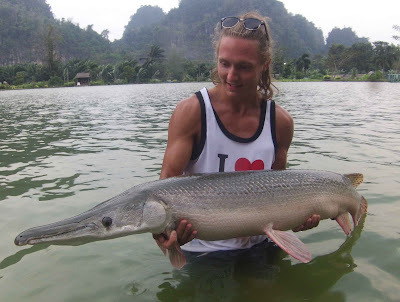 A lot bigger Alligator for Magnus visiting with his family. 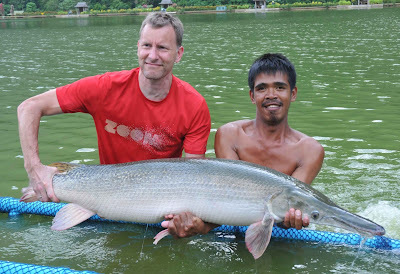 The Gar here are just unbelievably fat ..
A truly amazing catch for Thailand was this Jau Catfish estimated around 40lbs. Probably one of the biggest Jau caught anywhere in Thailand so far..
Another amazing catfish was this Monster Mekong caught by this German angler visiting with our regular customer Blue from Phuket . 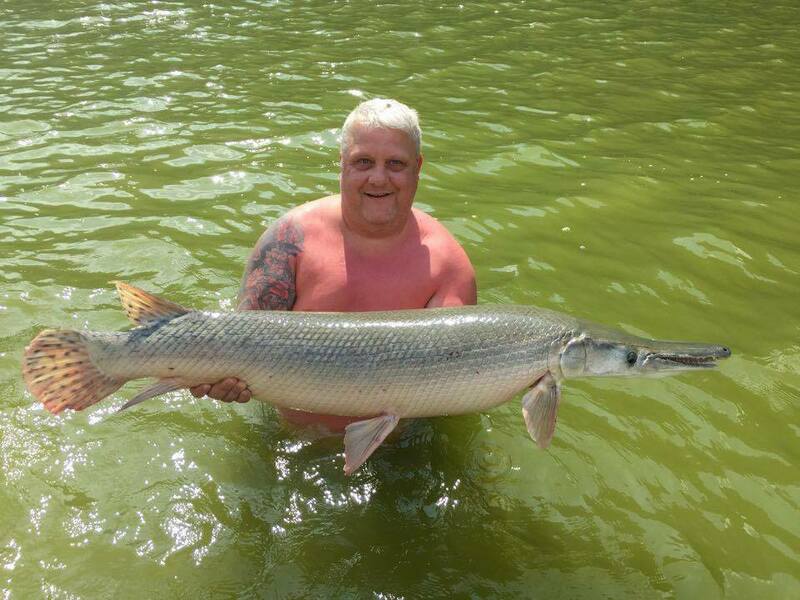 John Pearce also dropped by for some Alligator action . 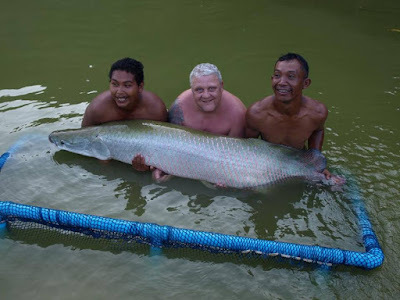 While John was here he gave my good friend Muriel a few pointers which helped her and her daughter Maddy land their first Arapaima . Peter and his good friend Tom dropped by for some Arapaima antics and landed some great fish. It was great to see them both ,but sad to hear that Peter was moving to northern Thailand for an extended break from the hectic traffic of Phuket .. We hope he still comes to visit us when he can . 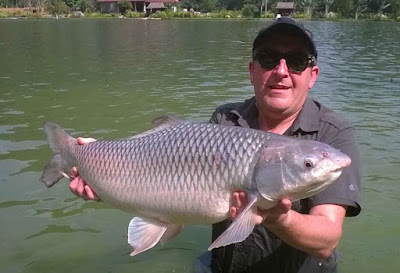 Another healthy Ari for Tom.. 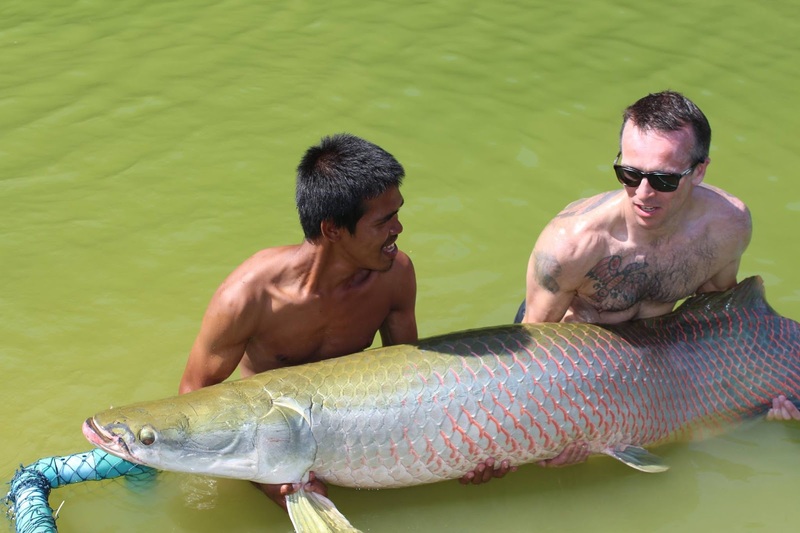 Here's Scott from England with 1 of 2 Arapaima caught on his first visit . I hear from lots of customers who are surprised when visiting other fisheries on how small certain lakes or ponds actually are after viewing some clever photo angles online. That is definitely not the case here where it is the exact opposite and you always get more than what you expect. 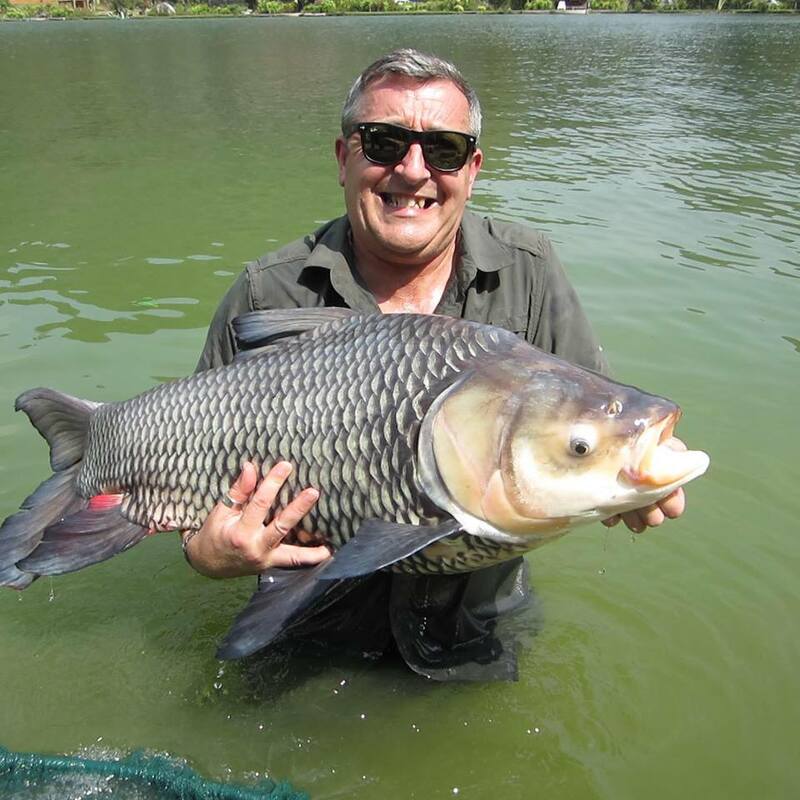 We often get asked how big is our lake compared to our competition . 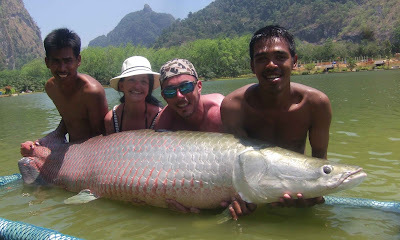 Our answer is always the same .. Why not try and cast across it and tell me what you think..
We prefer to let our resort , our service and our catch rates speak for themselves, but if you want to hear opinions from other visitors then please check our trip advisor review at Exotic Fishing Thailand where we have a 97% excellent approval rating . We look forward to seeing your smiling faces here at Exotic Fishing Thailand . 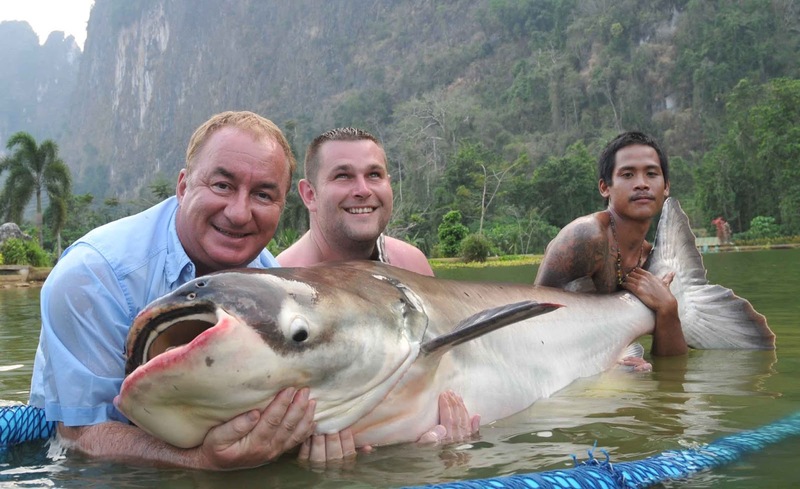 Please book ahead to avoid disappointment . As our name is spreading we are becoming more popular and are quite often fully booked . 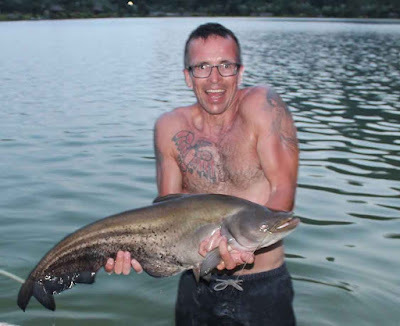 Calling the night before or showing up at reception is no longer a good idea. 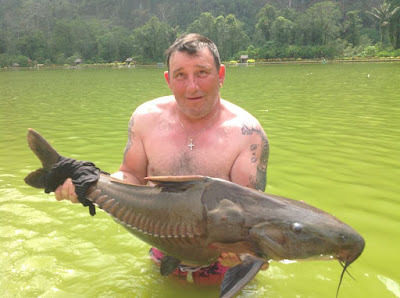 Please book as far ahead as possible and we will always try to find space for you as we appreciate all customers choosing Exotic Fishing Thailand. 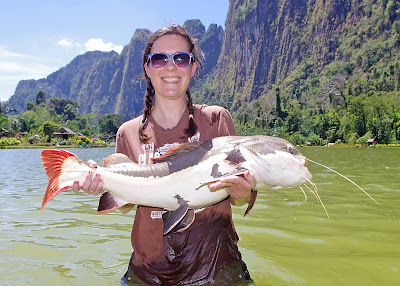 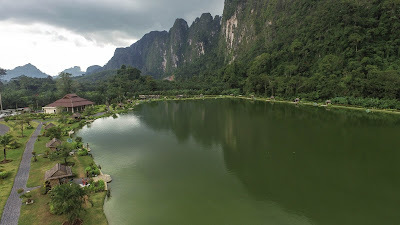 For picturesque scenery , great food and the fishing fight of your life please remember to book by using our website booking form at www.exoticfishingthailand.com or you can also email us directly at exoticfishingthailand@gmail.com.